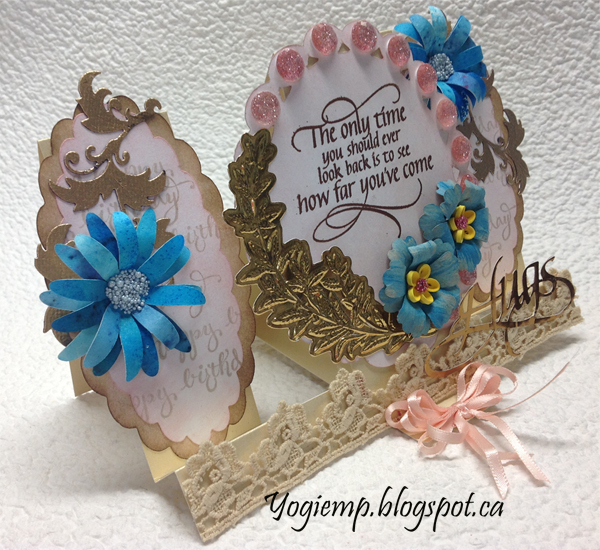 A friend made a stepper card using a Tatter Lace die set and I had to try making one on my own.... PS I HATE TOP FOLD CARDS... they always splay flat and don't stand properly. 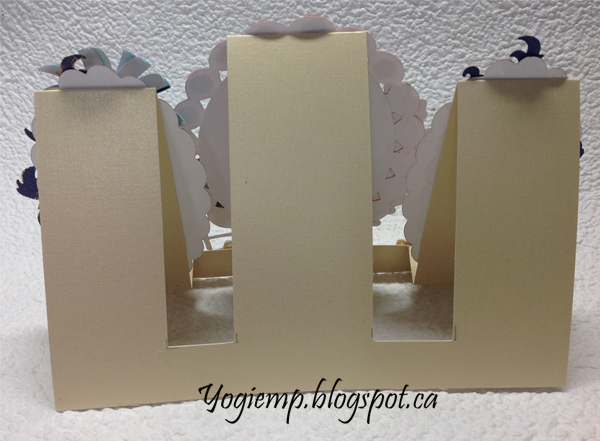 Cut, scored and folded my gold toned cardstock (Paper-Garden.ca) to create my structure. Used my electronic cutter to create the beaded ovals to fit and cut from white cardstock. Cut a smaller layer as well. Inked the larger cutting with some Distress browns. Stamped the birthday greeting repeatedly using Versafine "Vintage Sepia". 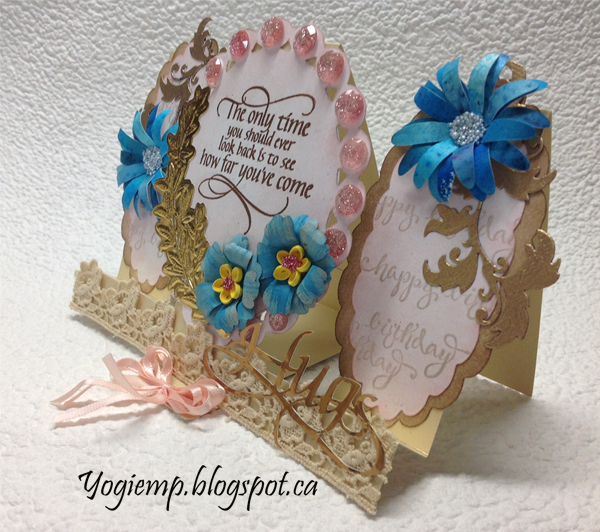 Sponged with "Spun Sugar" Adhered the 2 layers together and then onto card front. Die cut the flourishes (John Next Door "Regal Flourishes" set) from misc cardstock. 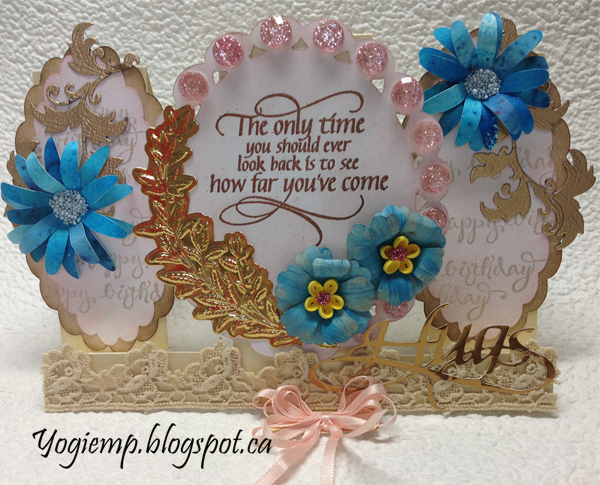 Inked with Versafine "Toffee" and embossed with "Queen's Gold" embossing powder. Adhered to ovals. Stamped the quote on the center beaded circle with the Toffee and embossed with Emerald Creek "Kettle Copper" embossing powder. Die cut the leaf (Tim's 3D cut emboss "Laurel") from Gold metallic cardstock. Adhered to front adding pink toned jewels. Raided my stash for the blue flowers. The ones on the sides made with oval shapes and Prills in the center. The ones on the center have a quilled flower in their center. Adhered a piece of beige lace to the bottom edge. 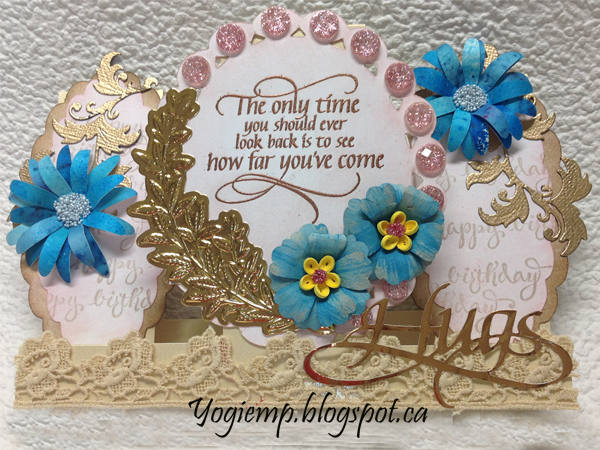 Die cut the "Hugs" from a DoCraft gold metallic cardstock and adhered to lace. So to correct the card from splaying float. I added a brace to the bottom of the card and am using a multi loop bow as the stopper..